In the interest in eating healthier more days of the week and save the “fun” for the weekend, I decided to do a play on pasta puttanesca and keep “no meat Monday” in mind. As long as its slightly spicy, tangy and a little salty, you can refer to it as puttanesca, at least in my books. 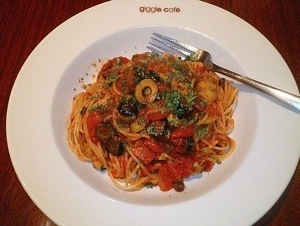 Main ingredient(s)	Spaghetti, tomatoes, olives, capers, garlic, anchovies (in Lazio). Spaghetti alla puttanesca (literally “whore’s style spaghetti” in Italian) is a tangy, somewhat salty Italian pasta dish invented in the mid-20th century. The ingredients are typical of Southern Italian cuisine: tomatoes, olive oil, olives, capers, and garlic. 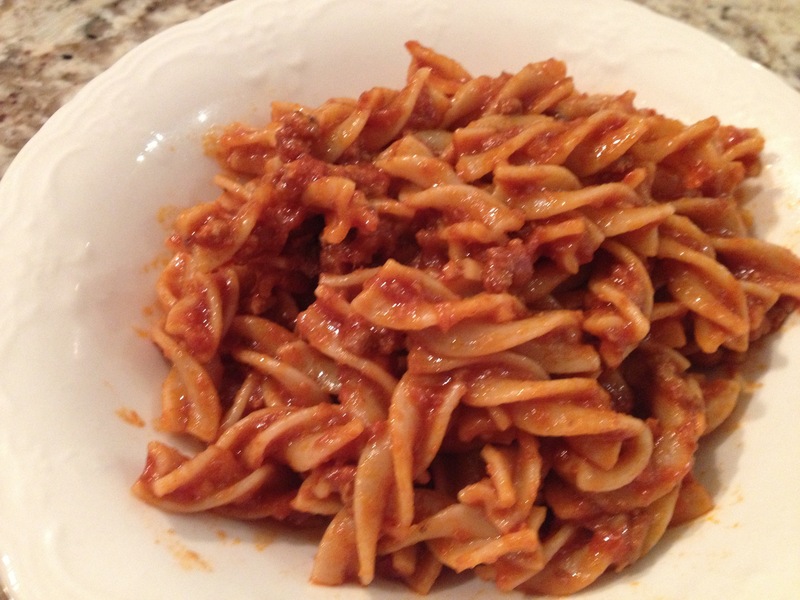 In my dish I used whole wheat twists and not Spaghetti, but that’s the beauty of pasta… You can change up the shape a little without changing the whole dish…. That said some pastas are perfectly paired for different sauces in how they “marry” or how the sauce nicely holds on to the pasta. In a fry pan I added chopped anchovies, ancho chili, garlic and onion… I stirred all that flavor until it all nicely blended and flavor wow was in the air. I transferred the anchovy mixture to the wonderful tomato sauce and warmed further while stirring for approx 10 mins to nicely marry all the flavors. At this point if I was making a true Puttanesca, I would add in olives and capers… Tonight I chose not to. After the pasta was boiled, I strained it and added it to the magical sauce ad stirred until it was completely coated. and now to top it off with my favorite parmigiana….. And viola…. Homemade magical flavors in a bowl. I have to say, between my wife’s sauce and my adders…. Wow flavors resulted! But please let me reiterate, cooking as long as it comes from your heart and soul…make it your own… Put your flavor touch on the dish. As long as you feel comfortable you can have fun in creating a unique twist on a basic recipe. In wondering how much of anything do I use, use the Quanto basta theory…. When enough is enough…. Go by taste and you can’t go wrong… Well maybe you can a little but that’s how we learn. 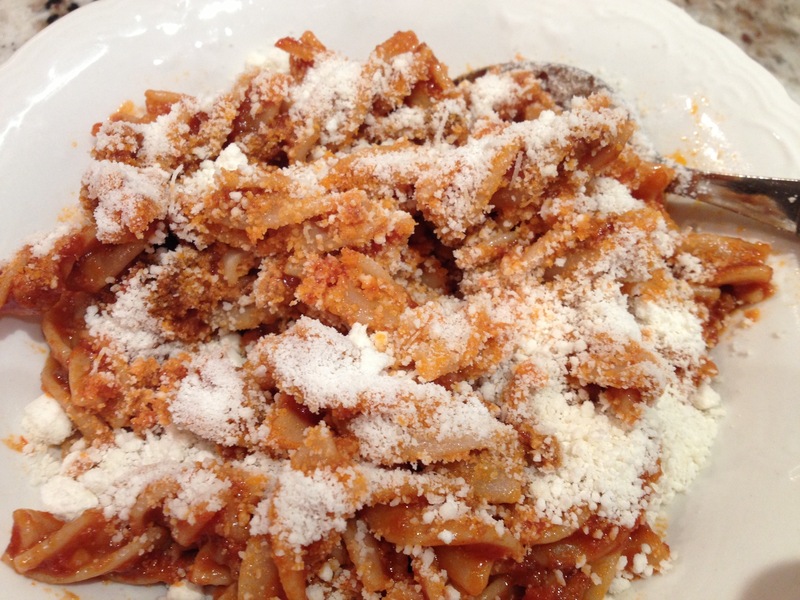 PS: if you so wish, have your pasta with a slice of your favorite bread or a nice glass of vino….. Or better yet, both!